An initiative to provide a platform for emerging upcoming artists to showcase their work, focusing on Artistic Contemporary / Modern / Dance Theater. To provide a platform for upcoming and emerging artists to perform and showcase their work. To encourage and develop originality and creativity of artists. To provide an experience for the audience to see a performance in “Studio Space”. To provide a space for the artists to receive “Immediate Feedback” from the audience. To create an awareness amongst the Indian audience for Artistic Contemporary Dance. Focusing on artistic contemporary dance to increase exposure to this genre. The selected dancers / choreographers will also have an opportunity to be mentored by the artistic staff of the Navdhara India Dance Theatre. Dance form encouraged would be Artistic Contemporary / Modern Dance / Dance Theatre. We are clearly looking for ORIGINALITY and CREATIVITY, NOT ENTERTAINMENT. The length of the single piece would be maximum of 10 mins and minimum of 3 mins. It could be solo, duet or group piece. It is open to everyone to submit an audition video clip. Upon receiving your video, you will be required to fill in a registration form (No charges for registration). Send the video clip / web link to platformdancing@gmail.com. 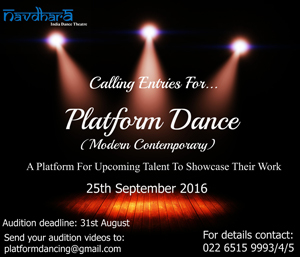 For further inquiry please send an email to platformdancing@gmail.com or call 022 6515 9993/94/95. 25th september 2016, Sunday 7:30 pm.